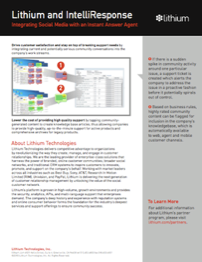 As partners, Lithium and IntelliResponse wanted to develop a joint sell sheet to showcase their “yet-to-be-created” joint software integration. At the same time, they wanted to utilize their respective style guides to be consistent with their established brand identities. 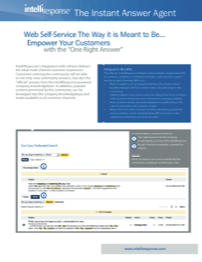 Digital Dazzle wrote the text and created the imagery depicting the partners’ joint solution. The integration benefits were highlighted and easy to understand. We also developed two brochures, one on each company's InDesign template, to showcase the same content in totally different ways. Digital Dazzle’s high impact sell sheets helped both partners to pre-sell their joint solution to their respective customer bases. Complying with company protocol, style guides and deadlines, Digital Dazzle produces white papers, brochures, data sheets, flyers and case studies. Our successful marketing communication pieces explain in a compelling way what a product does, the value it brings and why a reader should be interested in learning more.